We seem to think that Greece and Athens can hardly be saved unless we all cluster round the Acropolis. The most convenient way we seek to give expression to the continuity of Greek cultural heritage is by trying to put up our buildings around the Sacred Rock and to imitate what we think was ancient Greek architecture. In a most primitive fashion we rally around a symbol instead of endeavoring to study this symbol, to grasp its inner meaning and to use it as a source of inspiration. Athens heavily emphasizes antiquity. Everywhere, relics of bygone days are highlighted. Some are completely accessible, others behind rails, and those that are spontaneously found are covered up with glass. Either way, we feel ourselves in the glorious past, imagining the marketplace where Socrates once roamed or a patio as it would be during the symposia. With these monument-spectacles, we fetishize the ancient, turning it into an ambiguous icon rather than a source of inspiration. 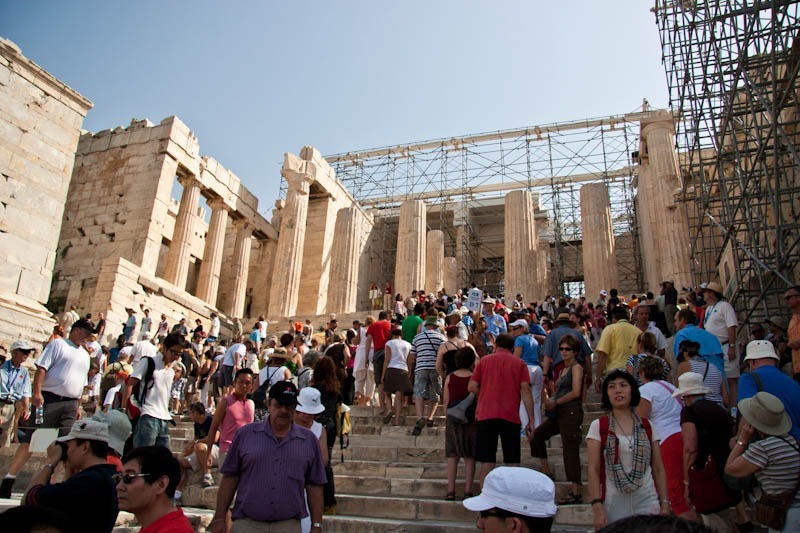 Hordes of tourists daily visiting the Propylaia – the only access point to the top of the Sacred Rock. This haphazard expansion is historically reasonable. 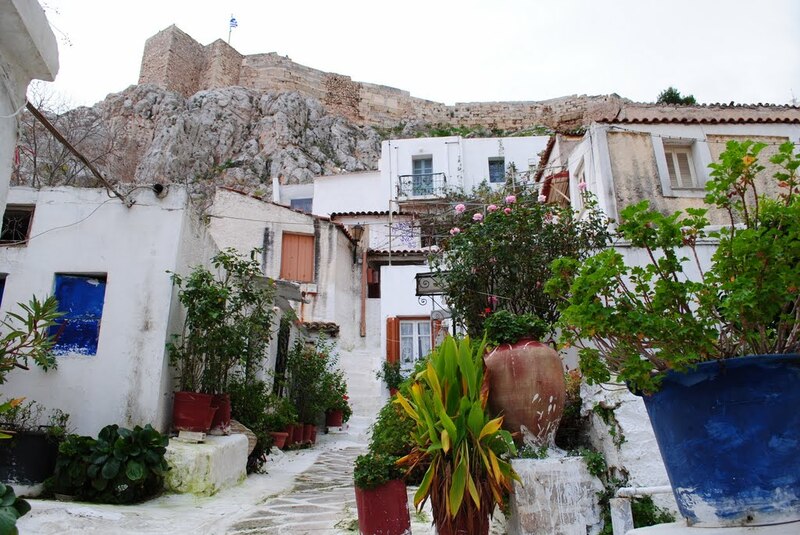 While Athens – in fact the Acropolis – has been continually inhabited, it was nothing more than a village, especially after the decade-long revolution. From 1833 until today, the population grew from about 4,000 to almost 4 million, with most growth occurring during the 20th century. Today it is one of the densest cities in Europe. 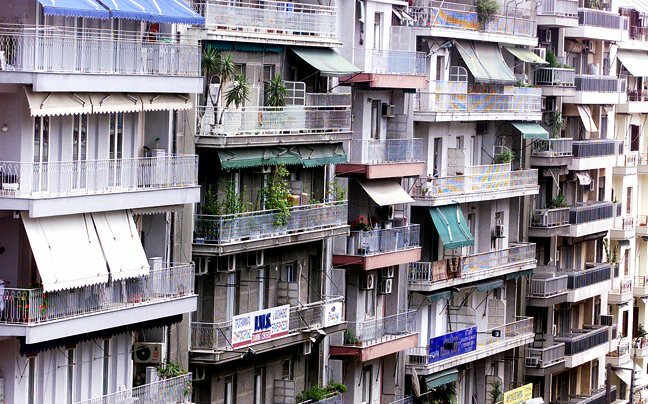 The prevailing architectural character of Athens is a result of this sudden population surge, lack of building regulation, and neglect for urban planning. In 1922-24, there was a wave of refugees from Asia Minor, following expulsion by Turkish forces and the subsequent population exchange. 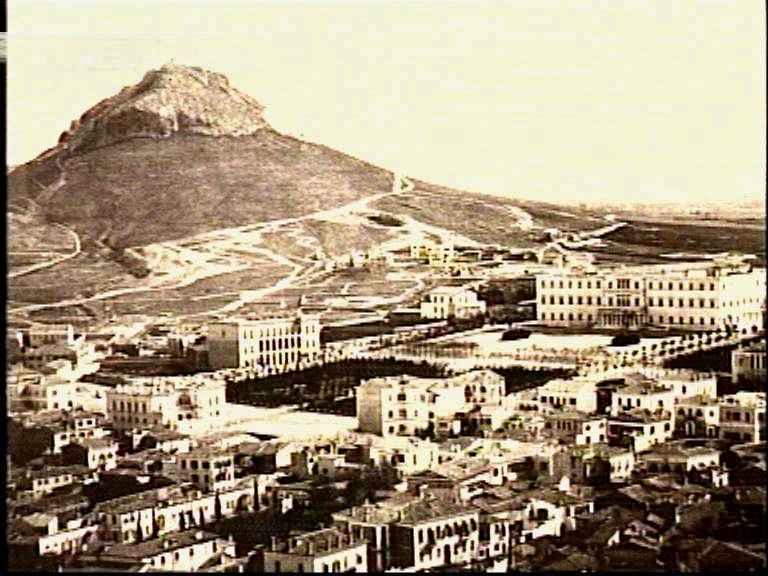 Athens’ population almost doubled between 1920 and 1928! 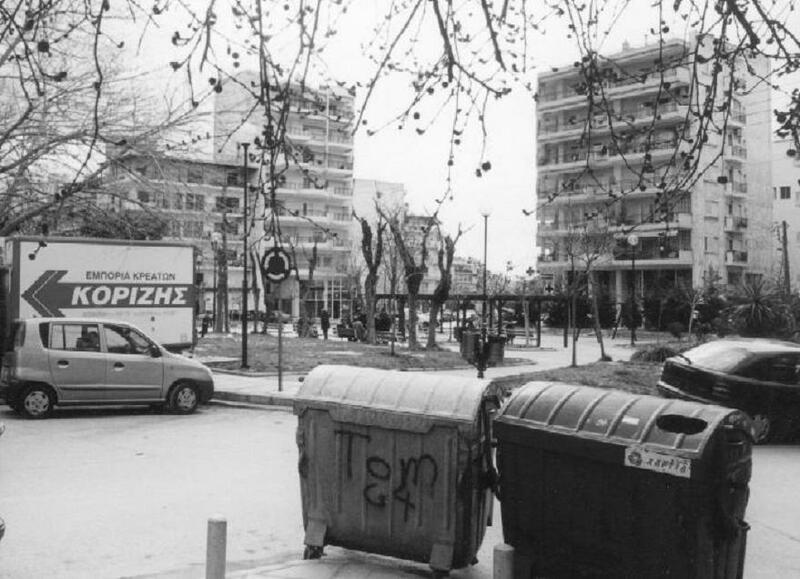 In the 50s, Greeks began moving from the countryside to the city, and by the 80s and 90s it was foreign immigrants looking for a place in the Athenian metropolis. Throughout all these stages, construction was laissez-faire. People built wherever they wanted and whatever they pleased, with attention to private benefit rather than consideration for urban development. 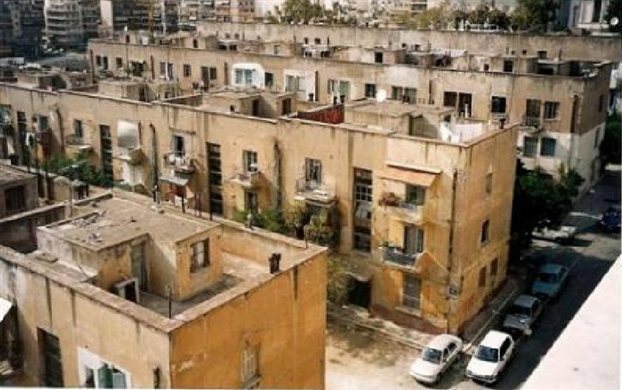 Starting from the boom of refugee settlements in the 20s, the “polikatoikia” was born, later rapidly multiplying by the process of “antiparohi”; a process that consisted of a property exchange between landowner and developer – land to build for apartments to live in and off of. 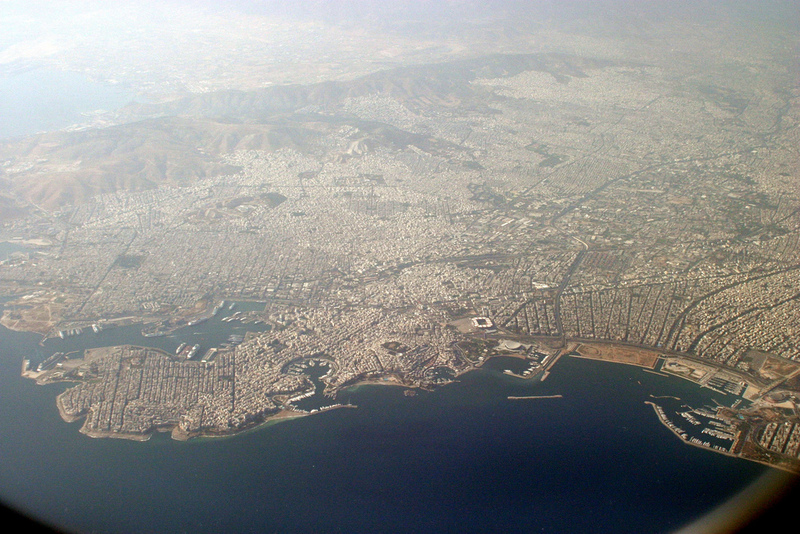 Much of Athens was developed in this way, creating space without design. This need for space also created a building culture of repetition, particularly post-1949 after a World War and Civil War almost back to back. Balconies stacked on top of each other dominated the façade, pulling private life out over the street. This porosity is emphasized at ground level, which is typically used for shops and sometimes arcades, allowing the public to penetrate the city block. Thus, besides their monstrous plainness and replication, “polikatoikias” succeeded in providing rapid housing and creating intimate, permeable communities. 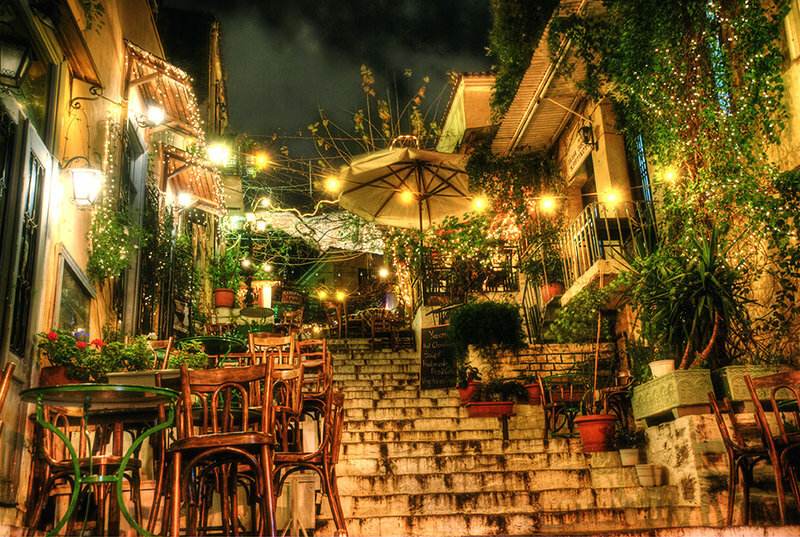 This place-less, closely-knit scene is reaffirmed walking through neighborhoods like Koukaki that, even though it is by the Acropolis, has an abundance of “polikatoikias” (albeit, some of the nicer ones) and a lack of parking space. But as we continue closer towards Acropolis, we find what might be the most unique area of Athens. Known as Anafiotika, this Cycladic community was built under the rule of Bavarian King Otto by immigrants from the island Anafi. 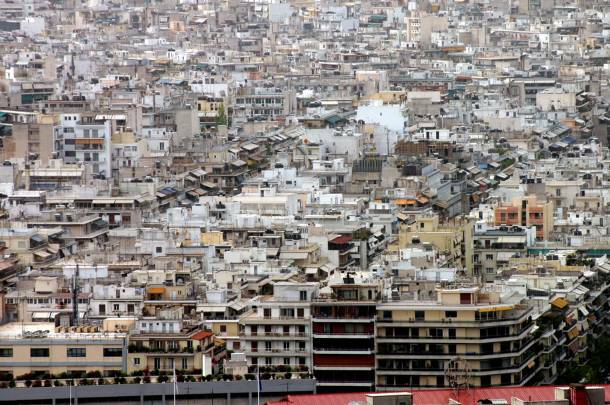 In the mess of Athens – still visible in the skyline – this is exemplary of the coexistence of the picturesque and the grotesque in the city. Continuing the walk around the Acropolis, we reach Plaka, another part of the ‘heart’ of Athens that escaped ruthless development. Moving downhill we spot crumbling and boarded up houses, a reminder of the practical mindset of Athens. These beautiful buildings are expensive and difficult to renovate, maintain, and inhabit so people move to high-rises and the suburbs. 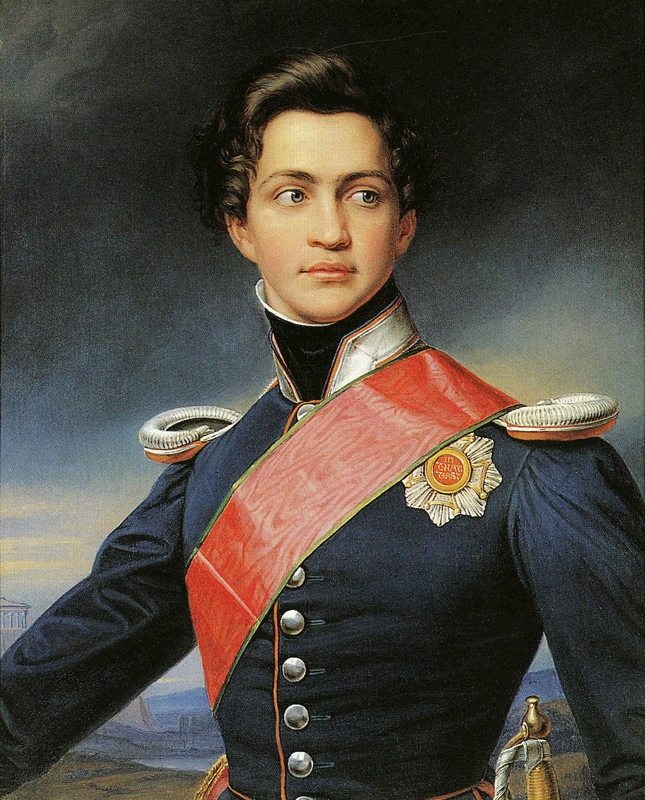 The mention of the ‘imported’ King Otto brings us to the very important concept of imported romanticism for Ancient Athens. After the revolution, European nations began imagining reviving the capital to its former glory. Greeks, needing support, complied, even instating a new dialect – “katharevousa,” deriving from ‘clean’ and citing ancient Greek – as the official tongue. Athens began capitalizing on ancient heritage as a catalyst for investment and growth. While “polikatoikias” and, even to some extent, the Anafiotika were based on practicality, the attempt to tailor modern Greece to its ancient character was impractical and implausible. 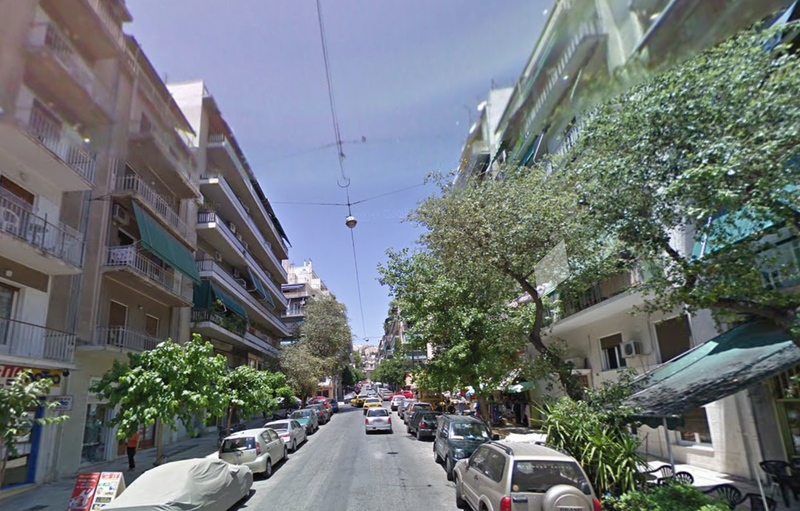 As Athens expanded and mercilessly modernized, this double identity became ever contrasting and cumbersome. This illusion culminated with Greece’s entrance into the EU in 1981 with reference to it as the ‘cradle of Western civilization.’ While geographically true, culturally modern Athenians were categorically different. It is only natural that Greek identity and architecture changes over time. The change becomes problematic when we obsess over the old and self-impose an illusion of the past. Today, Greece finds itself entrenched in a sociopolitical crisis, partly due to this dual identity. We observe that Athens, dotted with relics of antiquity, has very little to do with Ancient Athenian character. The aforementioned external romanticism and the internal unprincipled modernization are at odds with each other, and contemporary Greece collapses under the weight of its dichotomy. Instead it is productive to consider modern and contemporary Athenian architecture – its popular development, modularity, and challenge of public and private sphere – and draw inspiration and understanding from ancient paradigms, rather than trying to fetishize and relive the past. 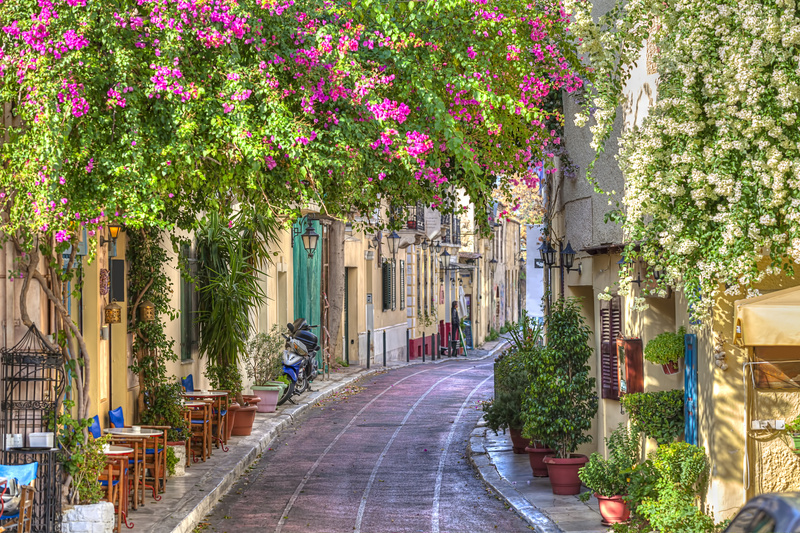 Athens needs a new urban philosophy for the 21st century. An extremely well-written analysis of the architecture and scape of Athens and what has led to its present day state. There are so many instances where old methods or “safe” designs have been utilized again and again, instead of harnessing the new ideas and their creative implementation. The time is ripe for renewal, for setting new guidelines and opening up future projects to modernization, innovative design and possibility. We must understand that giving a nod to the future is not betraying the past, but serves to compliment and enhance it. Thank you for your insightful comment! We agree – this is the time and most certainly the city for change like that. I really enjoyed the “tour” of Athens through the ages despite the “ugly” changes that have been made as the pictures clearly show.I feel like visiting the quaint area of “Anafiotika” for once more after so many years. A unique city that needs its past only to draw inspiration from as you aptly put it. Thanks very much for your great comments! An Architectural travel through Athens city center, past and present that can inspire new design approaches from Architects that really care. Looking forward to more Contemporary Architecture in this wonderful city…. Thank you for your comments. We hope our post initiates more dialogue.